Simple, fast and free. Kick-off a postal campaign with a quick email warmer or use these as standalone campaigns. Just cut and paste the campaign text of your choice, edit as appropriate and send to your existing opt-in mailing list or to a list of potentials. Offer any your existing customers a free 30-day trial, outlining the benefits, providing them with a brochure and letting you choose an appropriate call to action. Always send a test email for double checking of links and any layout quirks! MailChimp is brilliant for automating the managing and sending of emails to lists. It’s also free for small numbers of recipients. A striking and cost-effective way to convey a punchy, fully branded marketing message. Simply choose which postcard you’d like your customers to receive and send an email containing links from below to the appropriate artwork, your recipient list and of course your own contact information. 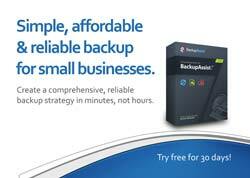 This postcard is a generic view of BackupAssist with a brief overview of the main features and offering your customers the opportunity to have a trial installed. It has a customisable rear for including contact information and your corporate logo.